Up to 100TB in 16 hot-swap drives high-performance dual-quad fiber channel or dual-eight iSCSI with following Operating Systems supported, tested, and configured: OS X, Windows, Linux, NetWare, Solaris, and OpenBSD. Nomadic3U RAID is the perfect complement to a GVS9000 and Metropolis, providing the fast, consistent performance required for video and data base. In fact, Nomadic3U RAID delivers the most bandwidth and I/O for working in high-definition (HD) video or supporting multiple streams of uncompressed standard-definition video with real-time effects. With up to 12.0TB of online storage, this robust storage system can hold nearly 20 hours of protected RAID 5 or 6 footage, even when used for editing in uncompressed 8K, 4K, HD 1080i/1080p. With capacities reaching 96.0TB in only 5.25” and the ability to scale from 96TB to 1.0PB in a single 42U rack space, the Nomadic 3U delivers the performance required for large databases, digital video footage, airline systems management, military, immense scientific data sets, expanding archives of financial information, and employee records requiring terabytes of storage. At the same time, offering data protection and near-instant data access that is crucial. With Nomadic3U RAID, you don’t have to make trade offs among data protection, performance, capacity — or price. In data intensive environments, increasing the capacity per disc drive lowers ownership costs by deploying fewer systems that use less cubic feet of space requiring less infrastructure such as cabinets, HBAs, and less wattage of power. The Nomadic 3U uses 7.2K, 10K, or 15K RPM high-performance, high-capacity SATA/SAS disk drives and offers Fibre, 12GB SAS dual host interfaces, allowing Nomadic LTO6backup. Nomadic3U with dual Redundant Fibre Channel controllers Hot-swap ports allows users greater flexibility and high performance with access to 100TB storage through a single fibre channel connection and access to data on all 16 drives. There is no need for a software RAID to stripe two RAID 5 arrays together in order to have access to single volumes. With other systems during downtime, your replacement machine must have the same stripe volume information in order to access to the entire RAID set. This creates a major problem in areas where data is most critical for reliability and timely delivery of projects that are vital to the organization. The Nomadic 3U's simple user interface allows you to configure 2-4 fiber channel or 2-8 iSCSI ports in a number of different ways, including Redundancy, Trucking and Cluster configurations. You can utilize the Copy command allowing you to execute copy through the 2nd fibre channel with all 12TB volume to a NomadicLTO-3 with fibre channel backup or to another storage device without the need for a fiber switch. You can also have two machines directly connected to each Nomadic 3U fibre channel port while one machine does the read and write and the 2nd machine is only doing the read. This is all done without the need of expensive SAN and iSCSI software or switches. All 12TB of data are accessed through a single port and archiving while you're working on your projects is no problem. 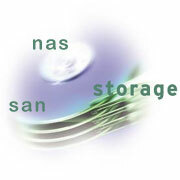 Using NomadicLTO-3 with fibre channel interface you can backup your entire 8.0TB volume through a single fibre port. Now high-end storage is within reach for any organization. Nomadic3U offers performance and reliability but also 99.999% availability as well as a dedicated service engineer, and the best price performance available. Nomadic storage is available in a full range of targeted configurations and the highest-density packaging of any high-end storage solution in market today (250TB in 42U Rack).